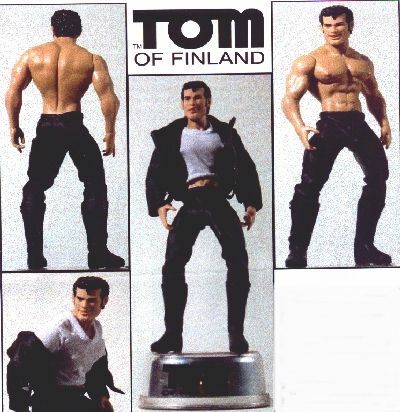 "The Rebel" is the first in the series of officially licensed Adult Action Figures based on the artwork by TOM OF FINLAND. This American classic, as portrayed by film greats James Dean and Marlon Brando is brought to life with TOM'S unique vision in Rebel. These serially numbered figures are 13" tall and feature: 15 joints, detailed paint, removeable clothing and a range of accessories. The figure is displayed on a 6" x 4" chrome-metalized base, which functions as a storage box for accessories and is covered with a 17" protective clear bell-jar vitrine. The surface of the figure is matte, not glossy. Ball jointed and flexible, anatomically correct, flexible hips, elbows, knees, hands, feet. Ball jointed neck, shoulders and hips.